The 131st NDMA Annual Meeting participants met with great enthusiasm on Friday, October 5 as the House of Delegates moved forward on critical issues impacting physician practices and patient care. The meeting was led by NDMA Speaker of the House Dr. Misty Anderson where participants heard updates from NDMA President Dr. Fadel Nammour and NDMA Executive Director Courtney Koebele. Advocacy is a primary role of the North Dakota Medical Association - in both the public and private sectors. One way to have our voices heard is to become unified through the power of resolutions. NDMA's resolutions are the culmination of issues surrounding your medical profession and the health of your patients. At this year's NDMA Annual Meeting, the House of Delegates voted to support the following resolutions. NDMA acknowledges that the requirements within the Maintenance of Certification process are costly and time intensive, and they result in significant disruptions to the availability of physicians for patient care. NDMA acknowledges that after initial specialty board certification, the NDMA affirms the professionalism of the physician to pursue the best means and methods for maintenance and development of their knowledge and skills. NDMA reaffirms and encourages the value of continuing medical education, while opposing mandatory Maintenance of Certification as a requirement for licensure, hospital privileges, and reimbursement from third party payers. NDMA communicate our position regarding Maintenance of Certification to the AMA, specialty societies, universities, and physician and industry groups involved with independent continuing medical, clinical, and scientific education. A resolution that opposes the legalization of recreational marijuana. A resolution to suspend the House of Delegates of the North Dakota Medical Association for a period of two years and replace it with an annual membership meeting and Policy Forum. Each year NDMA honors a physician and a non-physician who have made outstanding contributions to the North Dakota medical profession, their patients and community. This year’s annual meeting recognized the award recipients at a luncheon that was attended by many friends and family members of these distinguished guests. The NDMA Physician Community and Professional Services Award recognizes North Dakota physicians for outstanding leadership and services to the to the people of North Dakota and to the profession of medicine. The 2018 Physician Community and Professional Services Award Recipient is Dr. Michael Booth. Congratulations, Dr. Booth! Pictured from left to right: NDMA President Dr. Fadel Nammour, Award Recipient Dr. Michael Booth, and Dr. Kim Krohn, who nominated and presented the award to Dr. Booth. Congratulations! Learn more here. The NDMA Friend of Medicine Award recognizes non-physician residents of North Dakota who have distinguished themselves by serving as advocates for health care, patient services, or the medical profession. The 2018 Friend of Medicine Award Goes to Past President Jerry Jurena of the North Dakota Hospital Association. Congratulations, Jerry! NDMA President Dr. Fadel Nammour presents the Friend of Medicine Award to Jerry Jurena. Congratulations! Learn more here. Each year, NDMA recognizes physicians achieving 40 years of service to the medical community. Dr. Steven Strinden, urologic surgery with Essential Health in Fargo, was present to receive his 40 year award. Congratulations, Dr. Strinden! 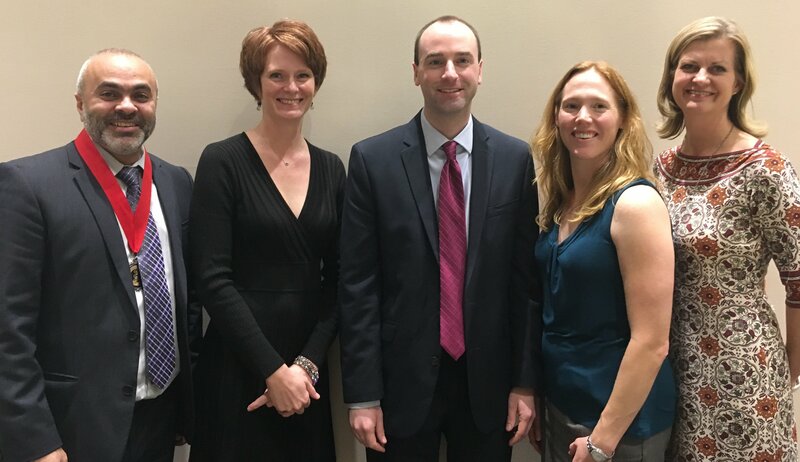 Election of NDMA officers was held during the 2018 Annual Meeting: Pictured from left to right: President: Dr. Fadel Nammour; Past-President: Dr. Debra Geier; Secretary/Treasurer: Dr. Joshua C. Ranum; Vice-President: Dr. Misty K. Anderson; Speaker of the House: Dr. Stephanie K. Dahl. Not pictured are AMA Delegate Dr. Shari L. Orser and AMA Alternate Delegate Dr. A. Michael Booth.